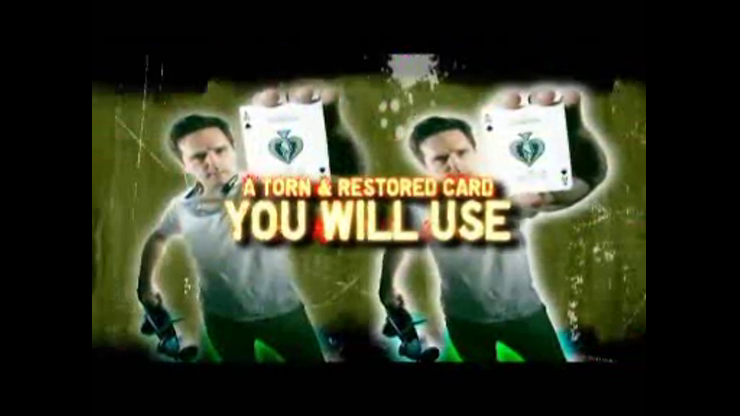 Cameron Francis has created one of the most workable and visual Torn & Restored Card's EVER! Your spectator selects a card and signs it on the face. You sign the card across the back. The card is torn into quarters. Then visually, magically and INCREDIBLY the card is reassembled quarter by quarter. And at the end of the trick the spectator can take the miraculously restored card home with them! Can be performed almost surrounded! One of the most angle friendly piece by piece card restorations ever conceived! Perfect for strolling and table hopping! Prophetic - A powerful prediction that hits 'em with a one-two punch! X Marks The Spot - Four X's drawn onto the back of four cards all jump onto a selected card. A true stunner! Striking Backs - A powerhouse, small packet all-backs routine! A Strange Visit - A Vistor-esque routine with a HUGE twist! Warped Fusion - A super cool tunnel/fusion effect that will leave your spectators speechless! The best visual, impromptu, so easy to learn "Torn and Restored" card miracle I have seen. Before purchasing this I was going through my mind with all the bill switches - but, the principal here blew me away!!! Highly recommended!! !